It was August 18th of last year and T. Russell Hunter was quite confused while sitting at the traffic light in his 2015 Kia Sorento. He looked at the green traffic light for a few seconds after stopping at the green light, unsure whether to go or stop. Hunter had been hitting the vodka that day, so much that he had lost track of how much he had been drinking. His eyes were blood shot and watery, he reeked of booze yet was likely unaware of just how drunk he was. But he made the decision to continue on through the green stop light and sped away, driving 50 miles per hour in the 35 mile per hour residential neighborhood lined with single family homes on both sides of the road. T. Russel Hunter had been the primary campaign manager for the Dan Fisher gubernatorial campaign and is a leading figure in the abolitionist movement here in Oklahoma including the push to get Senator Silk's SB 13 heard and passed. Hunter was against all sorts of abortion, even when the mother's life was in danger, calling all abortion murder in the first degree. It appears though he had left one option open for abortion, vehicular post term abortion, and he was willing to take out an entire family along with the fetus. 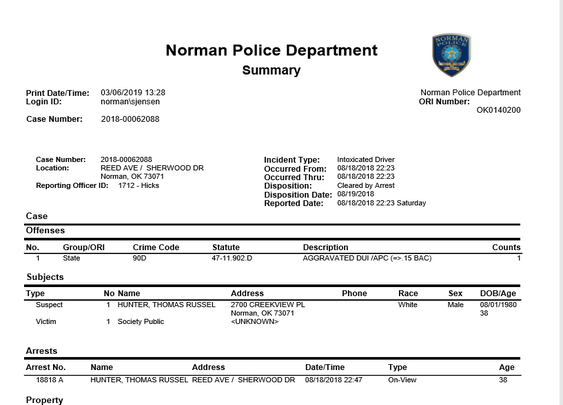 Luckily for the rest of society that night Lt. Oesterling with the Norman Police Department had noticed T. Russel Hunter and pulled him over to check on him. It was around 10:30 pm on a Saturday night and Hunter was miles away from his home and extremely intoxicated. What Hunter was doing that far from his home, that late at night, and in an unlikely route were he headed home, is unknown. The area where the police pulled Hunter over was at Reed and Sherwood in Norman, near the Kiwanis Park. Another Norman Police Officer named Hicks arrived to back up Lt. Oesterling. Next Hicks had Hunter perform the nine step walk and turn test, where the suspect walks heel to toe nine steps, turns on one foot, and walks back in the same manner. The officer is looking for a struggle to maintain balance while the instructions are given, starting too soon, stopping during the walk, using arms for balance, the lack of heel to toe movement, not taking a straight line, problems while turning, or taking the wrong number of steps with each issue being worth one point. A score of two points or more indicates a .10 or higher blood alcohol content. Hunter scored five points, with each item on the test scoring only one point even if the suspect made multiple mistakes on that one category. Of the eight categories of mistakes, Hunter exhibited five of the eight indications he was over .10% blood alcohol content. Next was the one leg stand test. The suspect stands on one leg with the other foot about six inches off the ground with their arms at their sides for a maximum of thirty seconds. The officer is looking for swaying, putting the foot down, hopping around, or the use of arms to maintain balance. Of these four indicators, Hunter failed three of them. Like the walk and turn test, the one leg stand test has a 65%l likelihood of outing a drunk. Drunks an usually do one thing at a time, never two things at a time, which is why drunks swerve was they drive or they speed up and slow down or stop at inappropriate times and locations while driving. With T. Russel Hunter having failed all three Standardized Field Sobriety tests he was arrested at 22:47 pm and consented to take the state breath test. Hunter was transported to the Cleveland County Jail and the time was noted at 23:19 for the standard fifteen minute deprivation time. When doing breath tests, fifteen minutes is allowed to go by before administering the breath test to allow any liquor in the mouth to dissipate. After fifteen minutes, all the booze picked up by the meter is coming from the lungs. Hunter was given the first test at 23:36, seventeen minutes after the deprivation period, over an hour after he was pulled over (who knows how long since his last drink) and given the field sobriety test, resulting in a 0.16 blood alcohol level. A result of .08 or higher is legally intoxicated. This is twice that. Three minutes later Hunter blew 0.16 again and he was processed into the jail on charges of Aggravated DUI. What are the symptoms of being over 0.08, the legal limit called impaired? 0.1%: You will be visibly intoxicated at this BAC. Reaction time and control will be reduced; speech will be slurred; thinking and reasoning are slower; and the ability to coordinate your arms and legs is poor. 0.15%: This BAC is very high. You will have much less control over your balance and voluntary muscles, so walking and talking are difficult. You may fall and hurt yourself. Vomiting may begin. 0.2%: Confusion, feeling dazed, and disorientation are common. Standing and walking may require help, as balance and muscle control will have deteriorated a lot. Sensations of pain will change, so if you fall and seriously hurt yourself, you may not notice, and you are less likely to do anything about it. Nausea and vomiting are likely to occur, and the gag reflex will be impaired, which could cause choking or aspirating on vomit. Blackouts begin at this BAC, so you may participate in events that you don’t remember. 0.25%: All physical, mental, emotional, and sensory processing functions are impaired. You will feel numb on many levels, and you are at a high risk of choking on vomit, falling and severely hurting yourself, or killing yourself unintentionally. The next day a sobered up T. Russell Hunter posted the $1000 bond using Big Red Bail Bonds, paying the bondsman $150.00 for the bond premium. By the 24th Hunter had hired an attorney, Malcolm Savage, and stood before a judge for arraignment on Aggravated DUI. Hunter plead Not Guilty at the time for some reason, likely wanting time to get his affairs in order as a guilty plea might have put him in the county jail a few minutes later. Then again this was six weeks after his candidate Dan Fisher lost in the primary, perhaps Hunter was still drowning his sorrows. By October the case had been set on the Jury Assignment Docket, in what appears to be a bargaining move by Hunter's attorney because two months later T. Russell Hunter pled guilty to a reduced charge of DUI and agreed to pay fines, take classes, and perform 40 hours of community service. In all the fines and costs were $1267.25, to be paid out over a year $100.00 per month with a final payment of $167.25. Hunter wrote out his understanding of what he was pleading guilty to, acknowledging that he could face a minimum of 10 days in county jail and up to one year in county jail. Hunter wrote that he indeed did drive a vehicle while drunk on the day he was arrested. In return Hunter received a deferred sentence. Hunter registered with Oklahoma Court Services for the one year probation term, paying the non profit service $40.00 per month to cover his monitoring costs. He agreed to not use alcohol for the term of the probation, enter and complete a DUI school, and undergo Substance Abuse Evaluation. He agreed to attend a Victim Impact Panel and serve his 40 hours of community service at a rate of 20 hours per month. Russell will end his probation on December 15th 2019 if he behaves himself. If he breaks probation he will be sentenced to jail time in accordance to the law. Hunter received his deferred judgment on January 11th, however it was for the Aggravated DUI, which he had pled down to plain DUI. By January 23rd the plea deal and sentencing was amended. Interestingly enough, the oscn.net entries do not show any payments despite the order to begin paying by January 13th. Should T. Russell Hunter refuse to pay he will be ordered to appear five to six months later and face a revocation of the deferred sentence. Hunter did try to cover his tracks and did succeed in hiding the arrest and conviction for months. 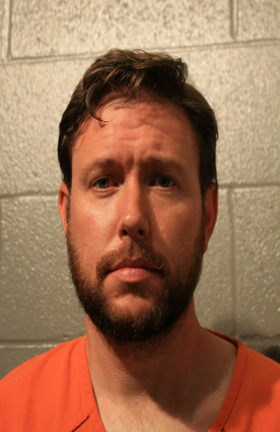 He used Thomas Hunter as his identity, giving an obscure email address to the court system and using a phone number that is associated with Areopagus Church in Norman rather than his own phone numbers. While we were scrambling to dig up the mug shot and incident report we had matched his date of birth, home address, wife's name but finding the 405-922-3374 phone number associated with Areopagus Church on their Facebook page was what cemented the drunk's identity. The church's Facebook page was plastered with AHA info and SB 13 including videos of T. Russell Hunter. With that certainty, we asked a few high ranking public officials for assistance to quickly obtain the mug shot and incident report. And in the word of one of the officials, bingo. There was one unhappy T. Russell Hunter sporting a spiffy orange jumpsuit. And this case is an excellent example of how we get a lot of our leads and how we investigate. The initial lead came in via email after our expose of the damage that SB 13 would have done to Oklahoma anti abortion laws. Then no fewer than ten people participated in tracking down the facts and documents, including the two elected officials opening doors and getting quick responses for documentation. It is sad that these patriots must stay hidden to avoid being attacked for doing good things but we all owe them a great debt. Of course the expense of all of this, the heavy drinking, the cost of the bail bond, paying for DUI classes and the other classes, the hiring of the attorney, and his now heavy monthly car insurance payments, all of this cost thousands of dollars and where is T. Russell Hunter coming up with all this money? I know that both he and John Michner have been soliciting funds like there is no tomorrow...... for what? Not like the anti abortion movement is costing them a lot of cash. Perhaps we know the answer now. Both Dan Fisher and Senator Silk are closely associated with T. Russel Hunter and have been long before this DUI conviction came to light. One would have to agree that a huge amount of hypocrisy exists for men to have this man on their team, one that would gladly risk killing an entire family while drunk driving, making that a far cry from a later term abortion. It is the ultimate abortion, killing any fetuses, any children, any adults that might be walking or driving along a road that T. Russell Hunter chooses to take. There won't be a Sunday night newsletter as we moved it forward to break this news.